Villa Loris is a two bedroom seafront villa set in 2 acres of private grounds. The villa is in a secluded location ideal for those looking for peace and quiet away from the crowds. Villa Loris has been built with in two acres of private seafront land, providing a private shoreline for guests and an amazing serene environment. Three villas have been built facing the sea but only the two end villas are rented out to guests. 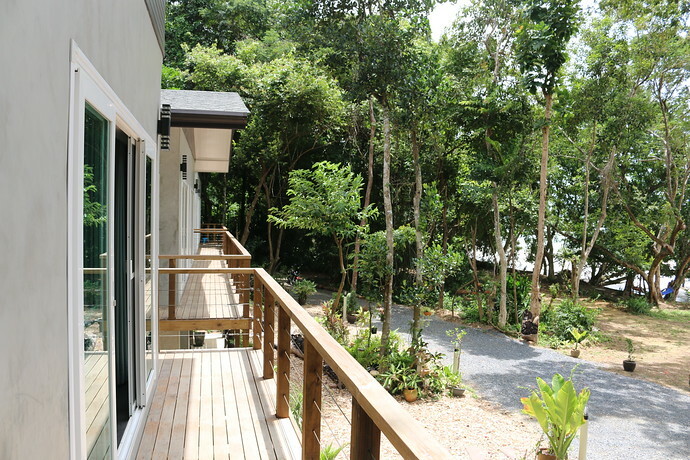 Villa Loris is the 2 bedroom villa shown on the left side of the above picture. The manager and staff will stay in the middle villa and the villa on the right is a one bedroom villa called Villa Cologus. The villas are separated with nice walkways in between and are built quite far apart. The Villa Loris is a two bedroom villas and enjoys aircon in every room. If you do not like aircon their is also an option of using fans. The doors and windows are fitted with screens so you can also keep the doors open all the time and let the breeze in. 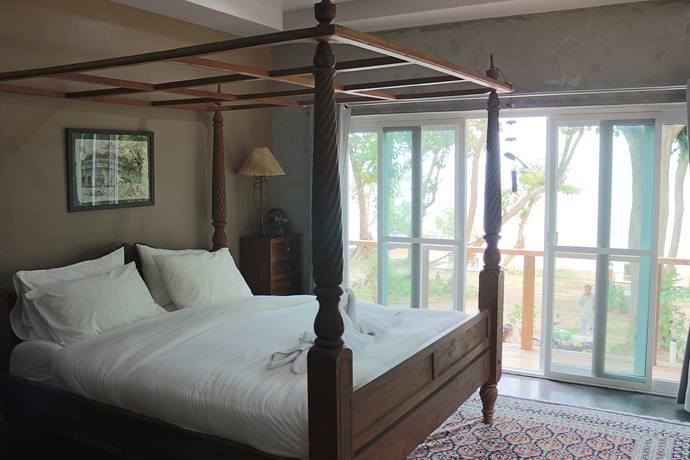 The front bedroom with four poster bed offers sea views and forest views, you can lie in bed and watch the sunrise over the surrounding Islands. The back bedroom also enjoys a double bed and forest views. 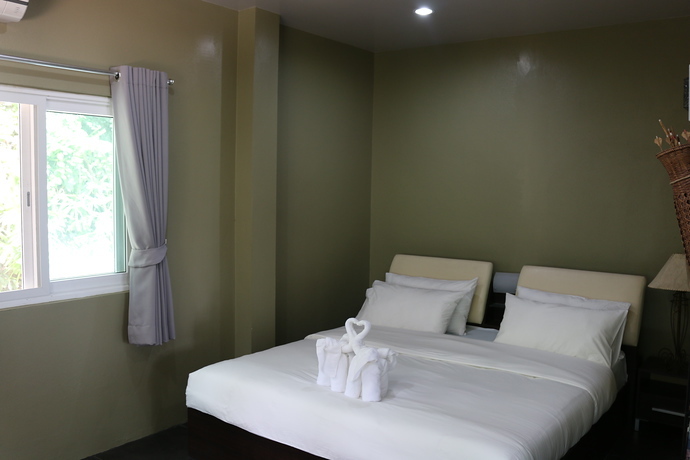 Both bedrooms share a large modern bathroom which is situated between the rooms. At the front of the villa is a lounge area and fully equipped kitchenette and table ware. If there are 5 guests this sofa can be used as another option for the 5th guest to sleep on. 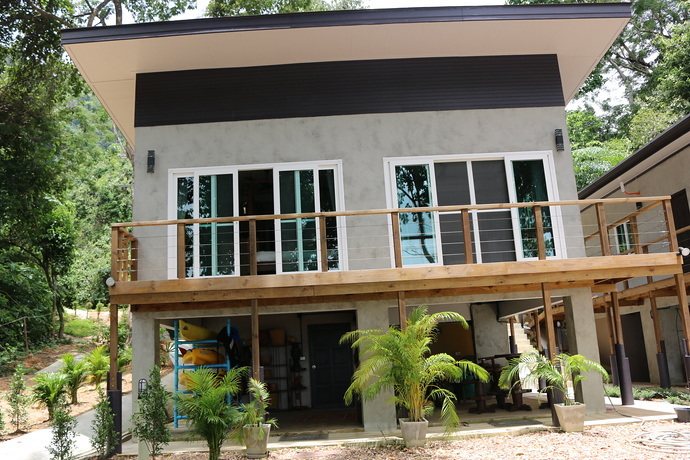 The villas are built above the ground offering additional storage areas underneath. Tables and chairs can also be found here for relaxing on or eating outside. This is good area as it cooler in the day time. With the sea only 30 meters away you have an option of swimming or using the free kayaks and outside showers after, or sit and day dream around the grounds in the specially designated seating and lounging areas. Another benefit due to the location – when the sun is dipping on the west coast it will dip behind one of Koh Lantas hillsides leaving this area a great respite from the days heat normally around 4pm. The master bedroom is located at the front of the villa. It has a large king size four poster bed. There are floor to ceiling windows letting in the natural light and door access to the outside walkways. The rooms will not get hot as there are also thick curtains at every window. On the other side of the wall is also a window with stunning tree views. Soft lighting, homely furnishings, wardrobe and drawers also adorn this room. There is also 2 book shelves stocked with interesting books for you to use. 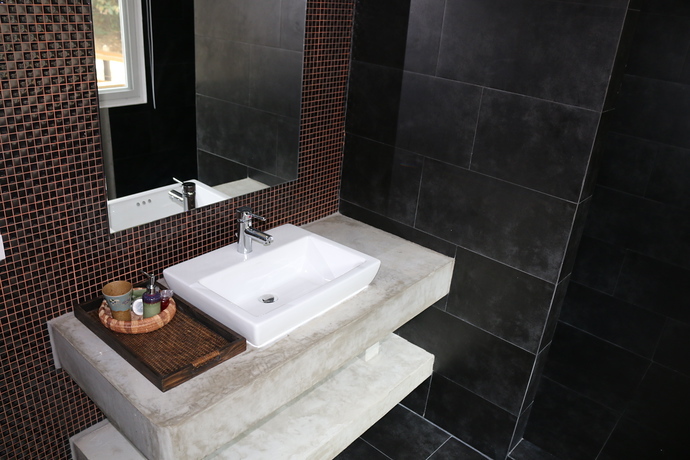 Both bedrooms share a large and roomy bathroom. 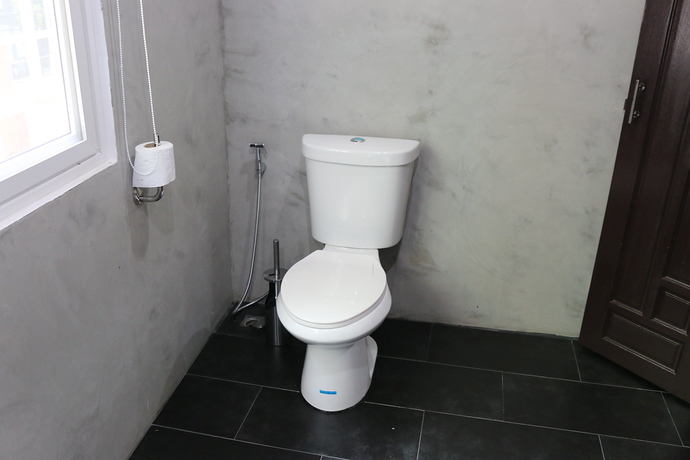 The bathroom has a western toilet, washbasin with large vanity mirror and sockets for shavers. 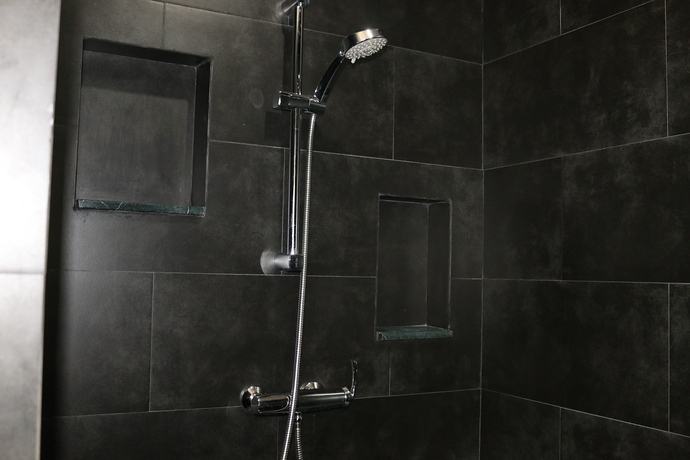 A separate hot water shower is found at the rear end of the bathroom. Bathroom essentials provided include fresh towels, shampoo and soap. The second bedroom is also big and located at the back of the villa. Due to where it is built the bedroom doesn’t have sea views but it does have windows with green foliage surrounding the villa. Unlike the master bedroom there is no door access to the walkways or terrace. This bedroom would be great if you’re a family travelling with kids as they do not have an option to wonder outside. 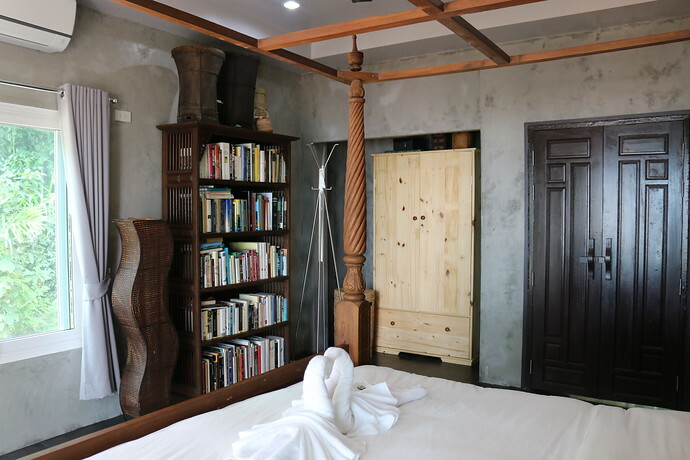 It has a double bed tucked away one side of the wall, large floor space with designer rugs. A wooden bench seating sits along one wall and a wardrobe on another. 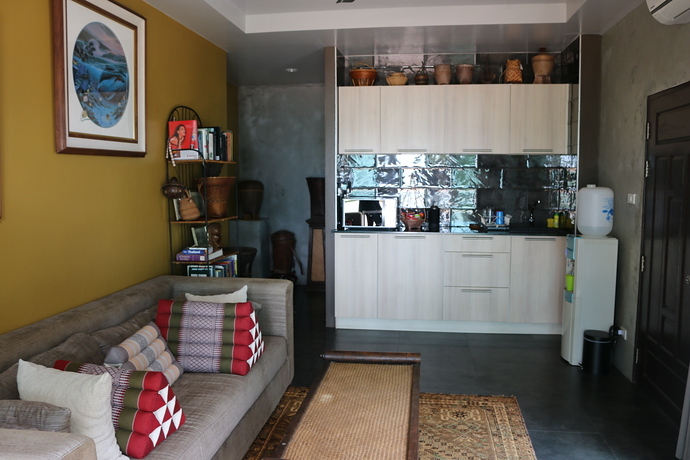 The kitchenette and lounge area are built at the front of the villa. This area allows access in and out of the villa with a wooden door on one side or the same floor to ceiling sliding glass doors with screens along another wall which offer sea views. Both doors lead out to the terrace and walkway which lead downstairs. The villa Loris enjoys an outside terrace walkway. The picture shows the entrance to the kitchen area. This walkway goes around the villa in an L shape. You walk to the back of the villa then down the steps to the beach. 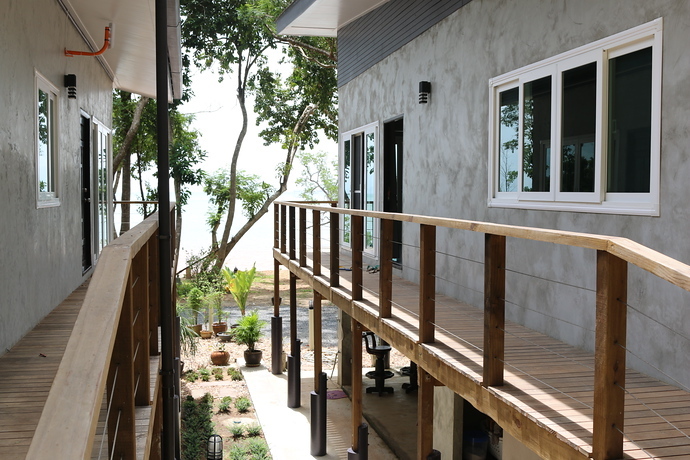 All the villas are separated with a nice space and walkways in between. Villa Loris is the end villa and the bedrooms are furthest away from the middle villa leaving them completely private. Villa Loris offers the sea on your door step with only 30 meters away. Here you can enjoy Free kayaking – or laze next to the sea on designated sitting area. For the early birds you can sit and watch the sunrise which is just as beautiful as some sunsets and a great way to start the day. The villas also have out door showers for you to cool off or rinse off before you go back in to your villa. Is Villa Loris For You? 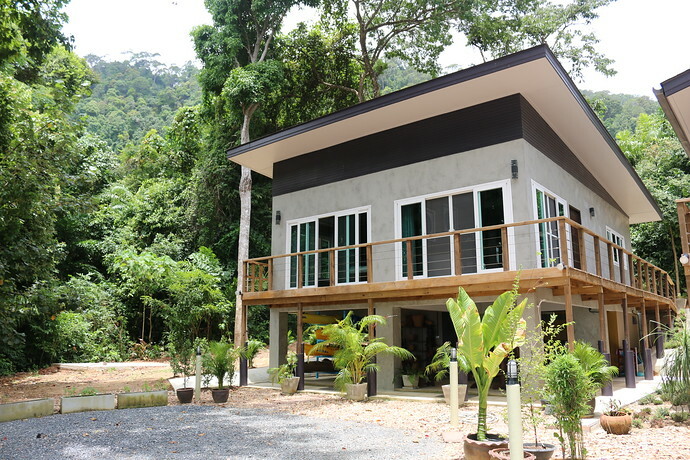 Villa Loris modern design and tranquil location are perfect for couples, families and friends wanting to relax, unwind and escape from daily life but still have the luxury mod cons. These villas will add to a truly unique experience of Koh Lanta which only a handful of people will get to witness. The location is far south on the east coast – this area is not as developed as the west coast where all the tourist beaches and hotels are. We hope this will add to the appeal for some guests looking for something different. You can close your eyes and listen to the sea movement lapping against the shore, hear the trees rustle and whisper or listen to many various birds chirping. You will not be kept awake by some bass line beats from a local party or woken up early by the mosque prayer. For some it may be too quiet as they like the hustle and bustle of noise, for others it will be perfect paradise where you can read a book and unwind. 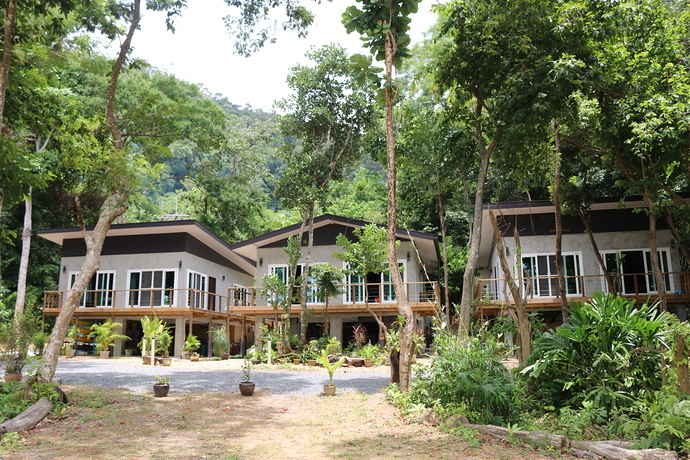 Where Is Villa Loris On Koh Lanta? Villa Loris has an on-site manager who will meet you upon arrival, give you the keys and show you around the villa. The manager will offer their expert first hand knowledge of Koh Lanta and also be happy to help and advise you with any problems you encounter. They will also help you organise motorbike and car rentals on the island. Then on the day of departure the on-site manager will come to inspect the villa for any damage before wishing you Bon Voyage. What’s Nearby To Villa Loris? 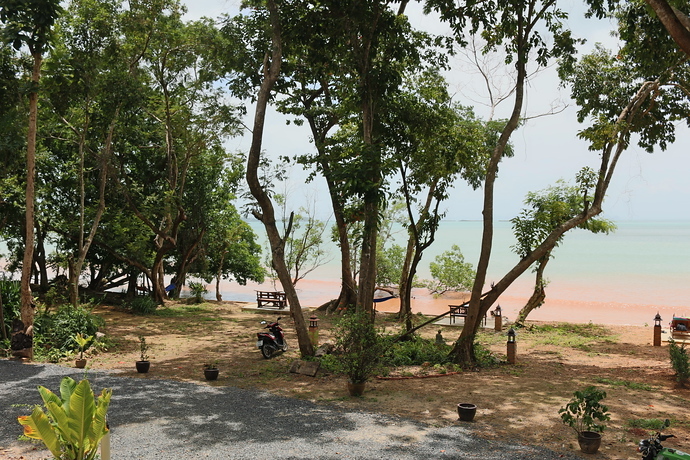 Villa Loris is not completely remote, the Koh Lanta Hospital is only 2km away, gasoline station 2.7km away and the Old town 3.6 km away with its many restaurants and bars and shopping, there is a market in the Old Town on Sundays for vegetables, fruit and fish. There is also a local fishing village near the villa if you want to go and haggle with the fisherman you can get a good price for some really fresh fish. There is also a 24 hour 7-Eleven shop just before the Old Town in case you need a drink late at night. Villa Loris does provide a kitchenette and breakfast options. There are also some great little gems close to the villa for eating and drinking. If you want a good coffee when leaving the villas turn left on the main road to Panaroma restaurant Jack the owner’s sister owns a coffee farm in Chiang Mai and its very nice.